Each July 2nd, I take time to pray and meditate and to reflect on July 2, 2000 and the thousands of people and hundreds of media cameras and trucks that seemed to show up out of nowhere on one side of the sand dune at Sullivan’s Island while on the other side I was chained up like my ancestors that had arrived there in the 1600s, 1700s, and 1800s had been. My chains were only on my arms while they were no doubt shackled also at the ankles to others and then bound in and around pestilence houses. When the chains fell from my arms because one woman cried out, “Let her go!” and the entire crowd chanted with her and the drums beat out, “Let her go!” and I fell to my knees and the chains released, GOD was releasing a burden from the minds and hearts of Gullah/Geechees that had been there for generations. They were now to see themselves with pride and not shame. They were to walk in human rights and not in a plantation story. They were to sing the songs of freedom and not songs of travail. Hunnuh chillun hafa shout cuz hunnuh free! Disya fa allawe! Each July 2nd, I think of how I was in a trance through the crowd, but I do recall that moment of freedom and I do recall telling the crowd, “My brother died today.” I recall the total silence and the sea of international and Gullah/Geechee faces looking on as I made this statement and informed the people that it was July 2nd when Denmark Vesey had been hung because he stood to seek freedom for the people-for my people. WE had come together on this date in this county of Charleston to continue the work for human rights that Denmark Vesey had begun so that his blood spilling and his dying would not be in vain. I find myself this July 2nd especially hearing my own words come back to me louder. The surreal vision of the crowd shoutin’, drumming, and flanking me and walking with me to this new level is clear. The many people that have come up to me over the past 15 years to tell me, “I was there at your enstoolment! I support you! I am proud of you! Keep up the good work!” seem to all be speaking to me this morning. i feel their energy telling me to march on. I feel GOD telling me that my living is NOT in vain. I find myself this July 2nd thinking of what some would call “irony” in the fact that the person that helped me along the way was the Pastor Senator Clementa C. Pinckney who died at Emanuel AME which was Denmark Vesey‘s church. It has only been days since he died there just before we were to meet to do more work together to continue the legacy of our Gullah/Geechee ancestors and insure that our people would be able to continue to live on and eat from this land and the waters of the Sea Islands and the Gullah/Geechee Nation. I sit and reflect on our conversations and I know that he is smiling and telling me that all will be alright and to continue on. I know that in continuing on, I am helping to insure that Brother Clementa’s living also was NOT in vain. Just before I went into prayer and meditation at midnight on July 2, 2015, I saw an image of someone that I came to know of and admire during my human rights journey come across the Gullah/Geechee Nation Facebook newsfeed. I saw an image of Patrice Lumumba of the Democratic Republic of the Congo who was born on July 2nd. I was shocked! I had not previously been aware of this fact! Lumumba’s face seemed to morph into that of Malcolm X and seemed to morph into that of Denmark Vesey and then seemed to come back to the face of who played Lumumba on the screen as I sat regaining strength to go on. My friends could only sit with me. They had no words because they had no idea that the film they saw was not the one I was seeing. I saw me and my life on the screen prophetically I realize these years later as I can see the faces of those who have smiled in my face while they worked with agents to attempt to assassinate me by character and then physically. I can see the faces of those that have the behind closed doors meetings to continue to neutralize the discussions of Gullah/Geechee human rights and self-determination by going to media people and shifting their focus back to the plantation and the crops and back to the flag away from the assassinated and massacred Gullah/Geechees, away from those maintaining their land ownership to show films of those that gave away their property when they gave away their culture in exchange for assimilated western minds and lifestyles that are only killing their souls. Their disease stricken bodies are still no sign to them that their deeds that they wanted done against others was actually coming back on themselves. This July 2nd I sit as the mathematician and Gullah/Geechee traditionalist that I am and I see the number 9 in the date. I see the significance of the three that went on before me. I see how a cycle is being completed and another begins with more chains falling off the minds of many more people around the world. I pray that when the chains fall off, they do as I did at Sullivan’s Island in 2000 and that they walk away from the chains instead of picking them up and putting them back on themselves. Mi pray hunnuh yeddi, Hunnuh tink free, hunnuh be free!” I pray that GOD raises up a new generation of Gullah/Geechees that will march with me and flank me as the crowd did before and that we continue our journey in and for human rights of Gullah/Geechee people. This is what self-determined people do! To my brothers, Denmark Vesey, Patrice Lumumba, and Clementa C. Pinckney, i continue to walk on with my head held high and doing this work for you. Your living is not in vain! Beat a drum for me and my soul will continue to join in with the rhythm polyrhythmicly. Disya fa allawe! WEBE Gullah/Geechee and FREE! Queen Quet was elected in a one year long election that took place from 1999 to 2000 which was the first time in ourstory or history that Gullah/Geechees elected their own leader. The confirmation ceremony for the vote and a spiritual ceremony to enstool her as also a spiritual leader in addition to being “head pun de bodee” was done at Sullivan’s Islands, SC in Charleston County on July 2, 2000. 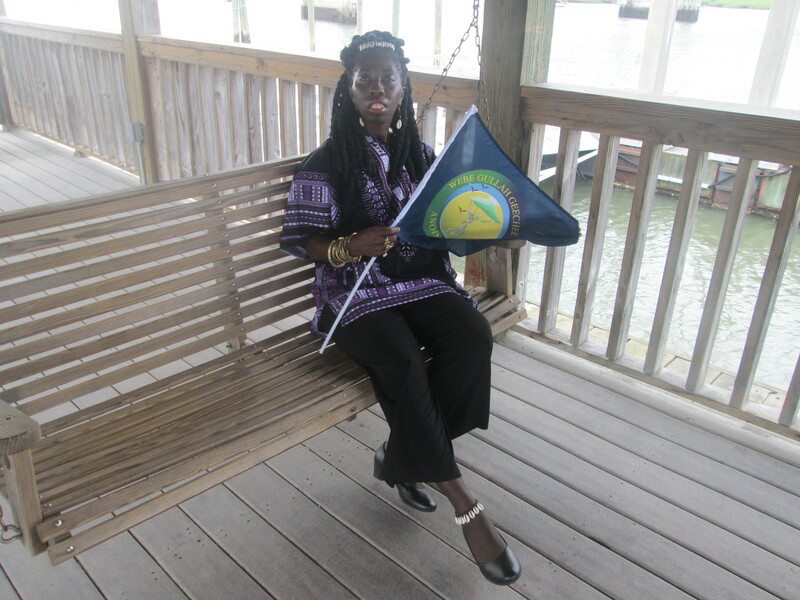 Queen Quet is now serving in her third term as the official leader and spokesperson for the Gullah/Geechee Nation. Tenki tenki fa disya! We gwine mek it fa sho! My Heart As Your Heart is With Our People and Humanity!!! !..Teach The Nations The Truth!! !…Sacred Feminine! !…999ETher HUgs..